Water is arguably the substance most important to maintaining life on earth. At the mountainous center of South America, Bolivia’s complex struggles with the scarcity and commodification of water captured worldwide attention at the turn of the twenty-first century. Symbolizing the denial of a basic human right, privatization of water provoked mass mobilization and dramatic social reform throughout the country. Today, Bolivia’s lingering water scarcity reveals instability in the wake of the ‘Water Wars,’ and the ongoing challenge of resource allocation that the Morales Administration currently faces. Rising water prices precipitated the conflict by denying basic human rights protection to vulnerable communities. In 1997, the World Bank refused to renew $600 million USD of debt relief to Bolivia unless the country agreed to privatize water. World Bank decision-makers reasoned that putting water in the private sector would help to broadly stimulate the Bolivian economy. Shortly thereafter, officials in the city of Cochabamba sold its municipal water company SEMAPA to the transnational consortium Aguas del Tunari, controlled by U.S. company Bechtel. Bechtel increased water rates for SEMAPA customers to $20 USD monthly, a 35 to 50 percent increase. The new rates were exorbitant to many Cochabambans, who made an average of only $100 per month. Tensions rose even higher when a local law extended Bechtel’s control of water resources to the city’s southern expansion and surrounding rural communities, regions outside of SEMAPA jurisdiction. A diverse group of civilian protestors coordinated their response to these unjust policies in a historic movement that framed water privatization as a violation of basic human rights. 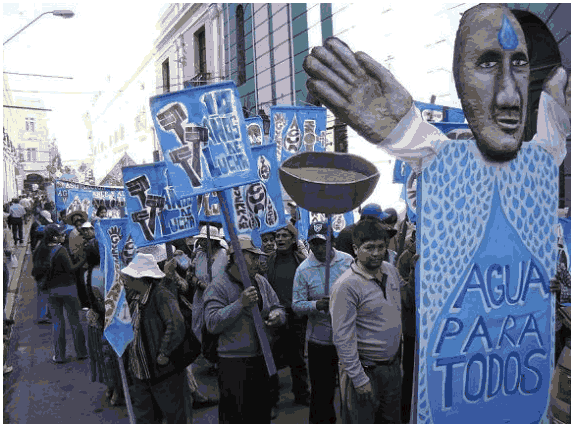 Citizens of Cochabamba and surrounding communities formed an “alliance of farmers, factory workers, rural and urban water committees, neighborhood organizations, students, and middleclass professionals in opposition to water privatization.”  Early leaders of the movement included activist and writer Oscar Olivera who earned the 2001 Goldman Environmental Prize for his role in the protests. 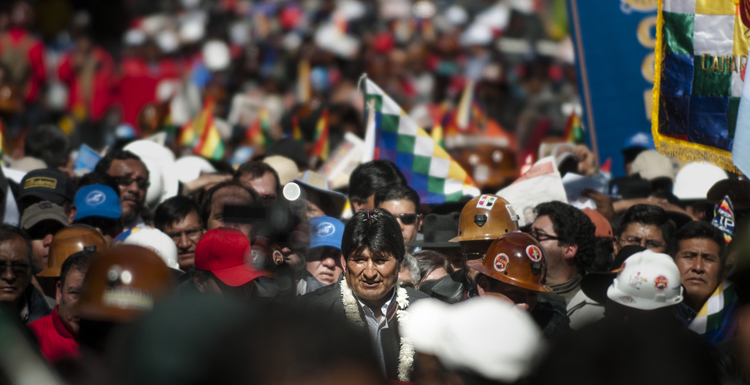 Evo Morales, then an organizer of rural workers in Chapare, traveled to Cochabamba with a coalition of activists to support civic strikes, roadblocks, and vast popular assemblies. These protests expanded to include issues of unemployment and the economy, causing President Hugo Banzer to declare a “state of emergency” on April 8, 2000. At the height of civil unrest, a citywide strike disrupted transportation, news media, and industry for four days. The Bolivian government offered La Paz police officers a 50 percent pay raise to encourage speedy and aggressive crackdowns on the demonstrations. Throughout the protest period, 110 protestors and 51 policemen were injured, and 200 demonstrators were arrested. Nine violent deaths were attributed to the social unrest. The privatization of water in Bolivia incited these protests by making access to water, and therefore to life, conditional on wealth in a district overwhelmingly known for its poverty. 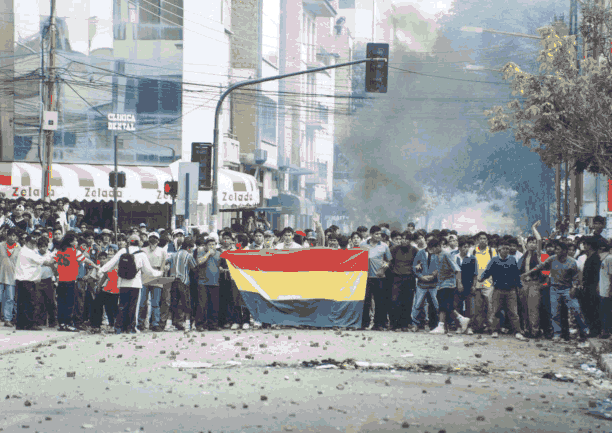 The resolution of Cochabamba’s “Water Wars” demonstrated the deeper roots of socioeconomic unrest, which would lead to radical changes in the structure and ideology of Bolivia’s central government. The intensity of civilian protest led the international community to place pressure on Bechtel to decrease its prices, and the company was eventually forced to abrogate its contract. Bechtel proceeded to sue the Bolivian government for $50 million USD, but withdrew its claims shortly thereafter. Water in Cochabamba and other affected communities then returned to public control. These civilian victories inspired subsequent movements demanding public ownership of natural gas in 2003 and 2005. In La Paz, the two following neoliberal administrations were short-lived, and the Bolivian nation then elected President Evo Morales of the Movimiento al Socialismo (Movement towards Socialism; MAS) party in 2006. 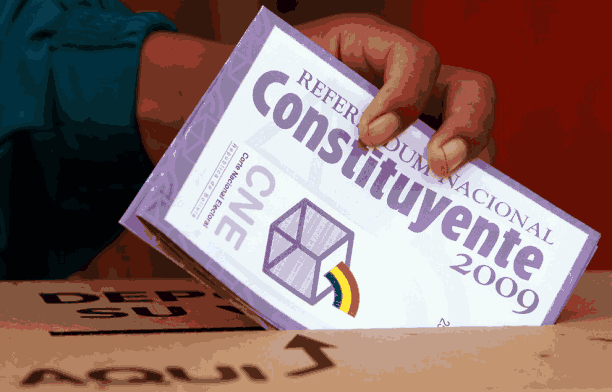 The new Bolivian Constitution, enacted under the Morales Administration in 2009, bans water privatization on the grounds that access to water is a human right. This post-conflict trajectory revealed the depth of civilian discontent that inevitably resulted in a socialist government and a precedent for popular protest. Past social demonstrations in Cochabamba still demand domestic and international attention and should inspire natural resource policy internationally. As stated by David Solnit of Upside Down World, “Bolivian social movements catalyzed by [the “Water Wars”] are, perhaps, the most radical and visionary in the world with their mass participatory, democratic and horizontal way of organizing and mobilizing, drawing on the communitarian roots of the majority indigenous country.”  While the movement’s previous successes are certainly praiseworthy, the issues it addressed are not fully resolved. The strong collective spirit that mobilized these protest victories is deeply established in much of the country, and it must be respected as a force for national change. The intersection of civilian activism and governmental policy can finally produce the reforms necessary to confirm water as a human right. As the global water supply diminishes, its equitable distribution becomes all the more crucial. This phenomenon reinforces the connection between upholding human rights and meeting basic survival needs. Rural communities and urban slums suffer disproportionately from a lack of sanitation and water infrastructure, leaving these communities more vulnerable to health problems from water shortages. Activists, policymakers, and officials throughout the Western Hemisphere have major stakes in water accessibility. As Solnit explains, “conflicts occurring within Bolivia due to increased glacial melt and water issues can be classified as both international and civil conflicts. Foreign corporations at the expense of the locals have long exploited Bolivia’s natural resources including water access for foreign economic gain.”  Policymakers need to learn from the Bolivian “Water Wars” to collaborate with civilian activism and to address current water scarcity issues with innovation and sustainability around the world. Gerhardt, Tina. “Water Wars: How One City’s Fight Against a Multinational Ignited a Movement Battling Water Privatization.” AlterNet. April 19, 2010. http://www.alternet.org/story/146521/water_wars%3A_how_one_city’s_fight_against_a_multinational_ignited_a_movement_battling_water_privatization. Bright, Ship. “Privatization, Globalization and Economic Water Scarcity.” September 21, 2009. Global Fresh Water. http://shipbright.wordpress.com/2009/09/21/privatization-globalization-and-economic-water-scarcity/. Achtenberg, Emily. “From Water Wars to Water Scarcity: Bolivia’s Cautionary Tale (Revista).” Bolivia Diary. February 7, 2013. http://boliviadiary.wordpress.com/2013/02/07/from-water-wars-to-water-scarcity-bolivias-cautionary-tale-revista/. The Goldman Environmental Prize. “Prize Recipient Oscar Olivera.” 2001. Silva, Eduardo. Challenging Neoliberalism in Latin America. Cambridge University Press. 2009. Solnit, David. “Reflections from Bolivia: Water Wars, Climate Wars, and Change From Below.” July 7, 2010. http://upsidedownworld.org/main/bolivia-archives-31/2583-reflections-from-bolivia-water-wars-climate-wars-and-change-from-below. Water for People. “Bolivia.” 2012. http://www.waterforpeople.org/programs/south-america/bolivia.html. Stewart, Brittany. “Melting Glaciers of Bolivia’s Cordillera Real.” ICE Case Studies. December, 2010. http://www1.american.edu/ted/ice/aymara.htm.